What a wonderfully festive weekend it has been in Singapore! Most of my waking hours seem to have been spent in and around the Esplanade soaking up the atmosphere of the annual Tapestry Festival, one of the highlights of the city’s arts calendar. 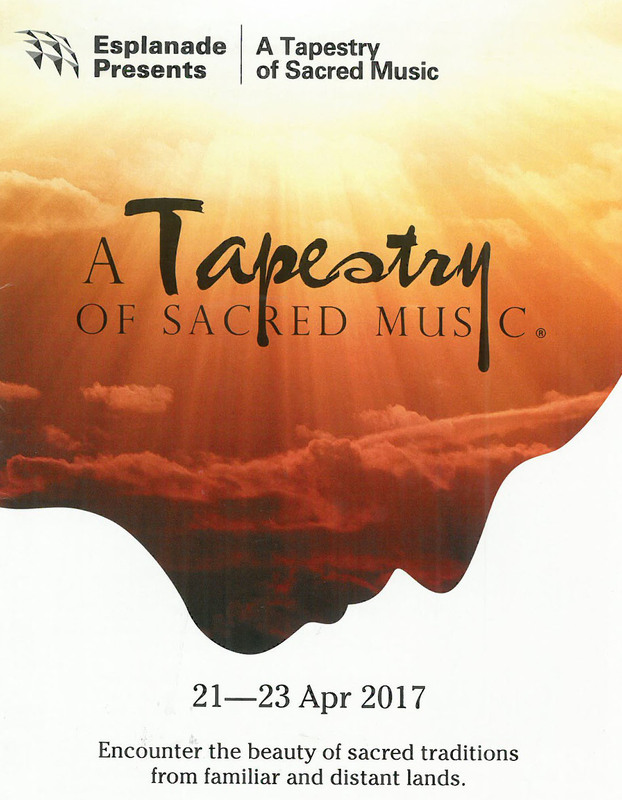 Running since 2009, the Tapestry Festival celebrates sacred music in all its guises. It tends to be more an ethnic arts festival than anything else, the sacred music it presents coming mostly from non-Christian and culturally remote faiths, but it affords us all a wonderful insight into cultures and religions which, even in multi-cultural and multi-faith Singapore, are alien. This year’s festival comprised, by my reckoning, around 50 events all of which, miraculously, were free. There was Korean Shamanistic music, Thai Buddhist chant, Sikh Singers, Devotional Songs of Shiva, Shima Singing bowls, 10th century chants, and 19th century French choral music, along with Islamic Devotional Poetry, Hula dancers, Arabic calligraphy and a talk on pre-Islamic carpets. Nobody could have any excuse for not being aware of the multiplicity of faiths in our world. A magical moment for me came on Saturday evening. Taking a break after the lovely medieval chanting of the three ladies who comprise La Voix Médiévale and before the Megwhal Singers of Rajasthan, I sat with my wine in the outside bar of Harry’s watching the sun go down as the flaming torches shimmered by the harbour. At the next table sat the Esplanade’s director, while at another sat a group of dancers who had performed earlier. Around us a crowd moved slowly around, lapping up the sights and sounds, talking about what they had seen and what they were going to see. Children played around noisily, a party of disabled people, bedecked in bright green tee shirts, was gently shepherded by ever-patient and attentive carers (the sacred in practice, you might say) and the whole thing just felt utterly festive; compensation for the absence of true Festival club where we could all have mixed and discussed across cultures and arts disciplines – hopefully that will come one day. However, there is a niggling ethical issue I have with this, which is probably the product either of an over-sensitive mind or an indicator of a suppressed conscience. Twice in my professional life I have been actively engaged with ethnic music. The first time came as I had completed my Masters degree at Cardiff and been accepted to do a doctorate. In need of funding, I approached the Welsh Arts Council. They had no funding available but, to my surprise, the Director offered me a job identifying, researching and setting up a musical instrument collection for the Welsh Folk Museum which would portray the wealth of music making in South Wales. For a year I travelled around, locating weird and wonderful instruments, learning how they were played and what their function was in the long-dead societies of which few then could remember, and then present their history and sound to interested students before putting them on permanent museum display. At the end of the year I was offered the job full-time, but I turned it down, partly because this was not what I wanted to do, but largely because it seemed so alien to me. It was not part of my culture, nor my tradition, and while I for a very short time probably knew more about it than anyone else, I felt always as if I was a stranger, an outsider, to a culture of which I could, by virtue of my birth, never be a part. The second time came around 20 years later when, in a project supported by the Sarawak Government, I was asked to identify and record the music of the indigenous peoples of Sarawak. A mad-cap scheme thought up in Kuala Lumpur to build a massive and utterly unrealistic hydro-electric plant in the middle of Borneo would have resulted in the flooding of native lands of some 26 different indigenous tribes. In a sop to environmentalists (the disappearance of one of these, the Swiss Bruno Manser, had drawn in unwelcome international scrutiny on Malaysia’s treatment of its non-Muslim indigenous peoples) it was decided to record their arts for posterity. Once again I spent a year travelling, listening and learning in the company of an ethnomusicological expert from Canada, and was intrigued and fascinated by the sounds I heard and the music I experienced. But when one man from a particularly remote tribe refused to sing for a recording, stating that for his song to be heard out of context would bring bad luck on him and his people, I realised that I really had no idea what was at the heart of what I simply regarded as interesting sounds. I could recognise the sounds the music made and enjoy it on my own terms. I could even look with the academic eye of a musicologist at its rhythmic complexities and remarkable tuning systems. But I could never appreciate the music as it was intended – I could only re-interpret it through my western eyes. The music lost its legitimacy once I was involved in either its delivery or reception. How much more dangerous it is for us to treat so carelessly music which belongs to faiths of which we have no understanding, and can never have because we are not of the culture, the land or the ancestry of those who create the music. To put on public display the sacred music of others is, as I see it, paralleled by the medical student who dissects and regards the most intimate details of a cadaver but can never begin to appreciate the person who once inhabited the very cadaver being so clinically inspected. It hit me very much at the Tapestry Festival this year during a display of Shona music from Zimbabwe. The hypnotically attractive sound of the Mbira was charmingly introduced by Fradreck Mujuru, and he was joined by two locally based musicians with a skilled interest in ethnomusicology. They could certainly make the right noises and the sound of the music was enchanting. But when Mujuru endearingly described the Mbira as a “telephone” by which the Shona people could contact their ancestors, I suddenly felt the dread hand of ethical doubt. What is the point of having a telephone if there is nobody to contact? Our two local musicians may have known how to operate the keypads and dials, but neither of them had the ancestors at the other end of the line nor, I presume, the inner conviction that they were there to be contacted at all? My worry is that while Christians have for so long taken their great musical legacy for granted to the extent that it is now almost wholly lost (how often do you hear in Christian worship today the great music which has sustained Christian beliefs for so many centuries? - it certainly is extinct in Singapore) are we not in danger of allowing the same thing to happen to the music of other faiths. We even lump it all together as if it were a single entity under the generic label “World Music”. My fear is that, by taking possession of selected parts of other faiths for non-faith purposes, we will end up doing with that what we have done to our own heritage – take it so much for granted we let it die. 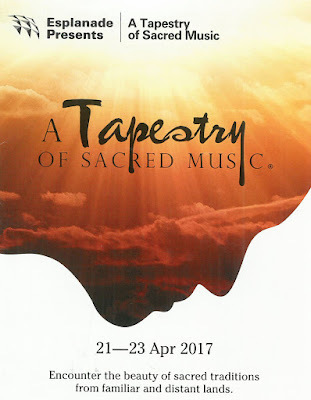 May the Tapestry Festival continue and thrive not as a means of preservation but as a simple reflection of the world in which we live yet which we largely fail to understand.